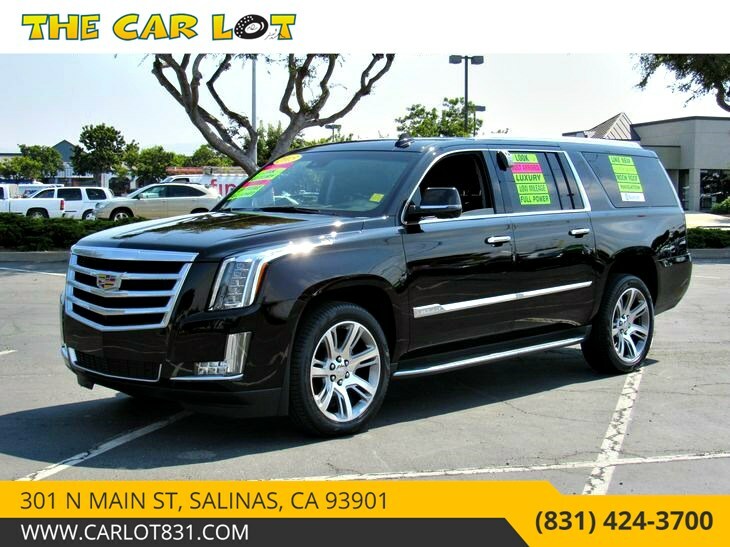 Beautiful in Black Raven, our One Owner 2015 Cadillac Escalade ESV Luxury 4x4 is a spectacular option that can haul your entire crew in style! At the heart of our SUV is a 6.2 Liter V8 that delivers 420hp while perfectly matched to a responsive 6 Speed Automatic transmission. This Four Wheel Drive team provides near 21mpg, the ability to tow up, and a smooth, capable ride thanks in part to an adaptive and auto-leveling suspension as well as a locking rear differential. Turn heads with the powerful presence of our Cadillac Escalade ESV Luxury with its drop-dead gorgeous chrome wheels! Climb inside, grip the heated steering wheel, feel the supple leather, get pampered by heated and cooled power front seats with memory functions, and heated second-row captain's chairs. Our CUE media touchscreen with navigation will guide you to your destination while you stay safely connected via Bluetooth or while listening to your favorite song on a Bose sound system with HD/satellite radio. You'll love the extra cargo room, sunroof, remote start, rear DVD entertainment system, tri-zone automatic climate control, a customizable instrument panel and more! Surrounded by advanced safety features such as a rear view camera, head-up display, blind-spot monitoring, lane-departure warning, forward collision alert, OnStar, anti-lock disc brakes, stability and traction control, and advanced airbags, you'll enjoy supreme confidence behind the wheel. Reward yourself with the most acclaimed SUV ever. Print this page and call us Now... We Know You Will Enjoy Your Test Drive Towards Ownership!